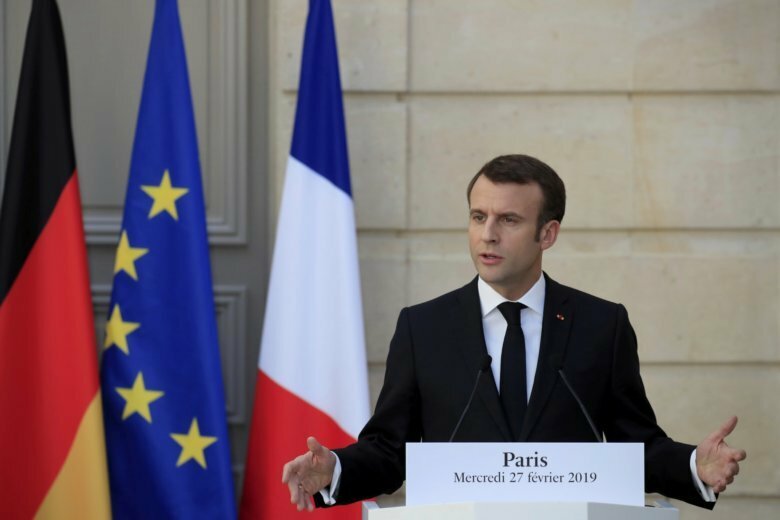 PARIS (AP) — French President Emmanuel Macron urged European Union citizens on Monday to use their votes in the upcoming European Parliament elections to protect and strengthen an “endangered” Europe. The French leader, who campaigned as a strong supporter of the European Union, called Brexit a symbol of the problems plaguing Europe, alleging that “lie” and “irresponsibility” led to Britain’s scheduled departure from the EU at the end of the month. “The trap is not being part of the European Union,” he said in the column, which was expected to appear in Tuesday editions of newspapers in the 28 EU member countries. Macron decided to directly address the bloc’s voters to an effort to use the elections to give a new boost to the EU, his office said. Macron suggests Europe should be more independent from other world powers. He proposes the creation of an agency that would provide every member state with experts to protect their voting process from cyberattacks and other manipulations. He also wants to ban the financing of EU political parties by foreign powers. To better handle the migrant crisis, Macron calls for stricter border controls and a common border force. He suggests introducing common asylum rules. Macron also proposes a defense treaty to define the bloc’s fundamental obligations in association with NATO, including increasing defense spending. Macron stresses that Britain should be associated to decisions in this field —even after Brexit. In the economic field, Macron suggests applying penalties or banning from Europe any companies that compromise key EU interests and values, such as environmental standards, data protection and payment of taxes. He says the bloc should give priority to European companies in strategic industries and public contracts as American and Chinese competitors do. Macron wants Europe to take the lead of the fight against climate change by setting a target of zero emissions of carbon dioxide by 2050 and halving the use of pesticides by 2025. “This is the choice I propose: to chart together the road to European renewal”, Macon concludes.